The 2019 Australian International Airshow and Aerospace & Defence Expo (AVALON 2019), held from Tuesday 26 February to Sunday 3 March, has broken exhibitor and trade day attendance records, with 698 participating companies, 161 official industry and government delegations and 38,952 attendances across the Tuesday to Thursday industry days. Attendances across the entire event, held at Avalon Airport near Melbourne, Australia, totalled 171,830. And while weekend hot weather softened public attendance figures compared with the 2017 event, the 132,878 public day attendances in 2019 were in line with the Airshow’s historical average. Attendees came to do business, network and see the latest in aviation, aerospace and defence technology, including flying displays from Australia’s first two Australian based Lockheed Martin F-35 Joint Strike Fighter aircraft, the US Air Force F-22 Raptor stealth tactical fighter, the Australian airshow debut of the Pilatus PC-24 Super Versatile Jet and the first Australian airshow display of a Japan Air Self Defense Force aircraft, the Kawasaki C2 transport. The fleet of 371 aircraft on display in the air and on the ground was a new record, as were the 2591 attendances at 36 associated industry conferences, seminars and briefings, which covered topics from airport development to business aviation, law enforcement aerial operations, defence aviation maintenance and unmanned systems. Visiting delegations and guests included 15 service chiefs, 9 National Armament Directors and 24 Chief of Air Force representatives, from 30 countries. There were 94 military aircraft in attendance from six nations. AVALON 2019 “firsts” included the inaugural Space Industry Association of Australia “Reaching for the Stars – Growing Australia’s Space Economy” conference and the first Australian Helicopter Industry Association “Rotortalk” conference. The event also provided a Science, Technology, Engineering and Maths (STEM) education platform for more than 1700 students throughout the week. “As an international aerospace industry exposition, AVALON 2019 was a record‐breaker in both exhibitor numbers and trade day attendances, with a host of major industry announcements and significant international participation from a total of 37 countries,” said AVALON 2019 CEO Ian Honnery. “Once again AVALON was a dynamic platform for interaction between industry, government, academia and defence. And once again it showcased Australian industry to the world, by bringing the world to Australia. Mr Honnery said that ongoing support from the Royal Australian Air Force, Victorian State Government and the City of Geelong has contributed greatly to the event’s position as one of the world’s great airshows and global business events. “The Royal Australian Air Force makes an enormous commitment to the airshow in aircraft and personnel, as do Navy and Army,” he said. “Together with enthusiastic support from the Victorian State Government and the City of Geelong, this has helped build AVALON as a signature international event, attracting senior civil aviation, air transport, aerospace and defence industry, military and government decision-makers from around the world. 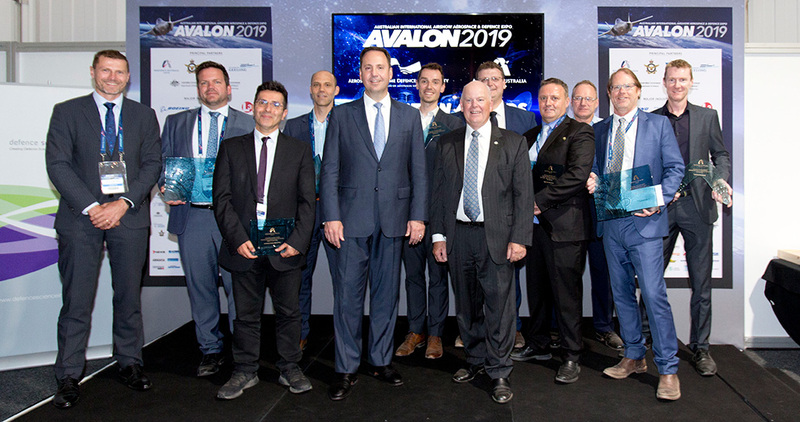 Seven Australian innovators have been presented with AVALON 2019 Innovation Awards worth some $45,000 by the Minister for Defence Industry, the Hon. Steve Ciobo MP. The winners include an SME whose Sapphire Crystal clock has ‘fast-forwarded’ Defence’s Jindalee radar upgrade by 20 years and a young innovator using 3-D printing technology to build extremely complex rocket motor nozzles that will reduce space launch costs by up to 25%. The Minister also presented the three Innovation Pitchfest Prizes today, for Best Innovation, Best Pitch and Most Relevant to the Aerospace Domain. The Innovation Awards program was created by Aerospace Australia Limited, organiser of AVALON 2019 – the Australian International Air Show and Aerospace and Defence Exposition. The Innovation Pitchfest is organised by the Defence Science Institute at the University of Melbourne. The first Innovation Awards were presented six years ago at Avalon 2013 and since then some $350,000-worth of SME Innovation Grants and Young Innovator Awards have been presented. In addition, three Award contenders won a High Commendation. “Our Innovation Awards were the first, and remain the only, such awards to recognise and reward the creativity, achievements and sheer excellence of innovative Australian companies and individuals in the aerospace industry,” said Avalon 2019 CEO Mr Ian Honnery. The fact that entrants were so eager to submit entries for the Avalon 2019 Innovation Awards is a reflection of both the quality and ambition of Australian companies and the growing prestige of these awards, Mr Honnery added. The National Award winners were presented with engraved glass boomerangs, symbolising the inventiveness of Australia’s first peoples and their unique contribution to aeronautical history. The boomerangs were designed and made by Wathaurong Glass Arts, an indigenously owned and managed cooperative in Geelong. The winners of the SME Innovation Grant and the Young Innovator Awards were presented with cheques for $15,000 each as rewards for their efforts and a small financial contribution to further innovation and the development of professional skills. “Our purpose as a foundation is to promote the development of Australia’s industry capacity in the fields of aerospace, defence, maritime and IT so we’re putting our money – literally - where our mouth is,” said Mr Honnery. “That the awards have been won by such high-quality candidates speaks for the quality of the individuals, companies and organisations making up Australia’s civil and military aerospace industry,” he added. The judges recommended this go to InnovAero Pty Limited of O’Connor, WA, for developing the BigEye aerial camera system. BigEye is the world’s best-in-class aerial camera system which when used in conjunction with the bespoke processing technology developed by sister company Spookfish Limited provides: Industry-leading resolution/altitude performance - less than 5cm pixel size captured from 10,000ft; Industry-leading accuracy with much better than 20cm RMS location accuracy for features on the ground straight from the processed imagery without the requirement for external adjustment; Industry-leading capture rate with up to 2,500sqkm per day per system at that resolution and accuracy. InnovAero has achieved export sales already worth some $30 million and its partner company, Spookfish, has been acquired by a US aerial surveillance specialist for $140 million. The judges recommended this go to Defence Innovations Pty Limited of Mulgrave, VIC, for developing the wireless Non-Intrusive-Flight-Test-Instrumentation (NIFTI). This represents a breakthrough and quantum leap in flight test instrumentation because it is lighter, cheaper and quicker to install and remove than a conventional flight test instrumentation package. Ordered by the RAAF and proven in supersonic flight testing, NIFTI uses stick-on sensors that communicate with an on-board Data Acquisition gateway using WiFi. It is possible to instrument a supersonic aircraft with a NIFTI package in a matter of hours (instead of weeks), and then remove the NIFTI installation in less than an hour to return the aircraft to frontline service. Its domestic and export market potential are both significant. The judges have recommended this go to Cryoclock Pty Limited of Adelaide, SA, for developing the “Sapphire Clock” product range. This award-winning technology provides signals that are up to 1,000 times more precise than any other commercial system: it is so precise, it gains or loses only one second over 40 million years. The Sapphire Clock has been incorporated into the Jindalee Operational Radar Network (JORN), whose upgrade aims to improve its ability to detect slow moving objects among significant background clutter, enabling JORN to see smaller objects, travelling slower, at much greater range. The impact of the Sapphire Clock in improving end-to-end radar sensitivity and resolution is such that it has been likened by Defence to “jumping the project forward by 20 years in just one day”. The judges recommended this Scholarship be awarded to Mr Graham Bell of Monash University and the co-founder and CEO of NextAero Pty Limited, Melbourne, VIC, for his ground-breaking work using 3-D printing to create an Aerospike rocket motor nozzle that has the potential to reduce the cost of space launch by up to 25%. The Aerospike nozzle essentially turns the traditional bell-mouth rocket motor nozzle inside out and provides greater efficiency, especially at lower speeds, but requires highly complex internal cooling channels to prevent overheating. Mr Bell and NextAero with resources from Monash University have employed 3-D printing technology to create the extremely complex internal shape required for an aerospike nozzle and have successfully tested it in Australia. The judges recommended this Scholarship be awarded to Mr Jimmy Toton of RMIT University, the DMTC Limited and Sutton Tools, all Melbourne-based, for his work employing 3-D Printing in the fabrication of cutting tools for very hard materials such as Titanium and Stainless Steel. Utilising 3-D printing technology will allow for significant productivity increases by producing complex and specialised cutting tool geometries that aren’t possible through traditional production processes, with optimised materials and internal cooling channels, while achieving superior performance outcomes. The aim is to increase the productivity of cutting tools used by Australian companies to manufacture high-technology components for aircraft such as the F-35 Joint Strike Fighter, reduce the cost of creating components in Titanium and Stainless Steel and so increase Australian industry’s global competitiveness. The judges recommended this be awarded to Inovor Technologies Pty Limited, of Adelaide, SA for developing a novel nanosatellite platform and a unique Space Situational Awareness (SSA) application. The nanosatellite platform consists of all subsystems required to support a payload in space, including the primary structure, the power system, pointing control, mission control and health monitoring systems. All are manufactured in Australia. The SSA mission, Project Hyperion, is a constellation of nanosatellites operating in Low Earth Orbit (LEO), looking away from Earth to monitor the high value Geostationary Earth Orbit (GEO) and Medium Earth Orbit (MEO). A unique machine learning based SSA detection and tracking algorithm enables high precision SSA by a small, low cost satellite. This enables a highly sought-after capability – the ability to persistently track a rogue or even potentially hostile GEO or MEO object of interest. Currently there is no system capable of doing this. The judges recommended this be awarded to Cryoclock Pty Limited of Adelaide, SA, for developing the “Sapphire Clock” product range. The judges recommended this be awarded to Toll Helicopters of Bankstown, NSW, for creating the Aeromedical Crewing Excellence, or The ACE Training Centre, a purpose-built training centre that offers world class training facilities and highly realistic mission simulation technology with a focus on technical and non-technical skills for helicopter pilots, aircrew and specialist personnel, such as air medical teams. Training facilities include a Full Motion Fight Simulator, Complete Aircrew Training System, a HUET simulator and wet and dry winch simulators. The training delivered to Toll aircrews, NSW Ambulance and ACT Ambulance medical crews, as well as operational and clinical crews from other Australian States, sets a new benchmark in the domestic market and follows international best practise by utilising the most modern training programs, techniques and the latest simulation technology. The judges recommended this be awarded to InnovAero Pty Limited For developing the BigEye aerial camera system. Defence Innovations Pty Limited in the Avalon 2019 Innovation Award for Aeronautics and Counter-Drone Technology for developing the NIFTI Non-Intrusive Flight Test Instrumentation System. Twenty three SMEs, research institutions and individuals from six Australian states and territories have made the short list for the $60,000 AVALON 2019 Innovation Awards, submitting innovations across a range of fields from aerial sensors to helicopter training, a system to monitor space assets and a water‐powered rocket school teaching aid. Judged by an expert panel, the AVALON 2019 Innovation Awards attracted a record 68 submissions from 33 entrants. They will be presented in six categories as part of the Australian International Airshow and Aerospace & Defence Exposition, 26 February ‐ 3 March 2019. The awards are open to Australian companies and the Australian subsidiaries of overseas parent companies. The innovation can be a new product or service to a new approach to business, with entries judged on originality and utility in aerospace, space and defence. Past winners have included TAE Aerospace for its Fountx wearable engineering technology, BAE Systems for its EDMAP corrosion management system and Thomas Global Systems for its “plug and play” LCD replacement for legacy cathode ray tube aircraft instruments. The Avalon Innovation Awards are part of a program also involving Maritime, Land and Civil Security Industry Innovation Awards, presented biennially at the Pacific International Maritime Expo in Sydney, the CivSec Civil Security Congress and Exposition in Melbourne and the Land Forces exposition, which has been held in Brisbane and Adelaide. The program has awarded $305,000 in Innovation grants and awards since it began in 2013. The AVALON 2019 Innovation Awards were developed by AVALON 2019 organiser and national not-for- profit foundation Aerospace Australia Limited as part of its mission to promote the development of Australian industrial, manufacturing and information/communications technology resources. “The key criteria in the AVALON 2019 Innovation Awards is that the innovation must not only be ground breaking, but must also provide a tangible benefit in defence or industry,” said AVALON 2019 CEO Ian Honnery. The Australian International Airshow and Aerospace & Defence Exposition is a biennial global business event, attracting senior civil aviation, air transport, aerospace and defence industry, military and government decision‐makers from around the world. The 2017 event included 664 companies from 25 countries, 158 delegations and more than 33,000 accredited trade attendances, with a total event attendance of 210,664. AVALON 2019 will be held from 26 February to 3 March at Avalon International Airport, near Melbourne, and is supported by the Government of Victoria, AirServices Australia and the Australian Defence Force, in particular the Royal Australian Air Force, Defence Science & Technology and the Department of Defence’s Capability Acquisition and Sustainment Group (CASG).